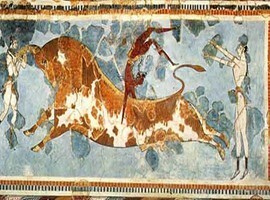 The Greek myths tell us stories about King Minos, the labyrinth and the Minotaur. 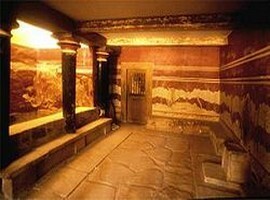 All this actually took shape only in this century with the discovery of the palace from which Minos ruled. 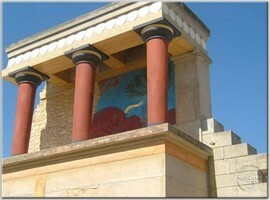 The location of Knossos lies 5 km south of Heraklion, Crete. 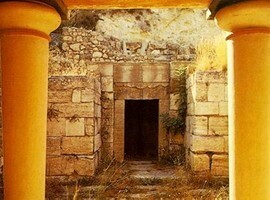 With the complex plan passes, staircases and hidden rooms, the palace could be named as maze, like the one Minotaur lived in. 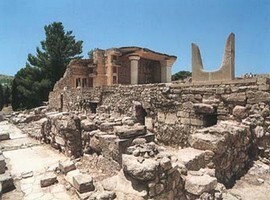 In reality the ruins are the remnants of a typical complex, with houses and a governor, whose people showed great interest in painting the walls with bright colors and sophisticated hydraulics. 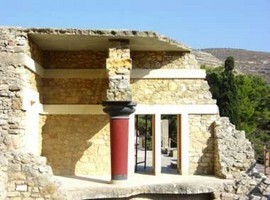 Such features make the palace of Knossos one of the most prominent and important remains of the ancient Mediterranean, also the palace is also the form of early-example of Minoan architecture. 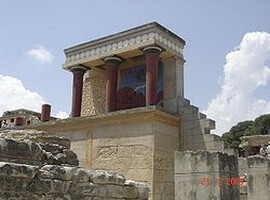 Although there have been other major Minoan palaces on Crete, Phaistos, Malia, Zakros-that of Knossos was the largest, covering an area of 20.000 m², and seems to have played a dominant role on religion in administration and financial affairs of the time. 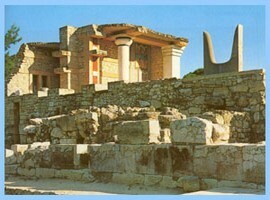 The first palace was placed in 1900 BC, upon the ruins of a Neolithic site. 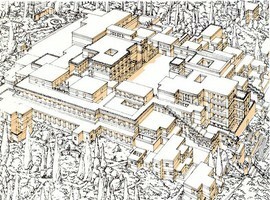 It consisted of separate housing complexes, which for a time the first phase are linked. 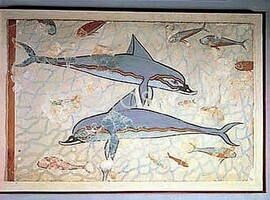 These days are only visible the remains of a successful period, when the palace was rebuilt larger and more impressive, in about 1700 BC. Aptly located in the natural sloping ground, the palace was constructed at different levels which are connected with monumental staircases, light wells with small sunken courtyards that allow light and air to enter and circulate. 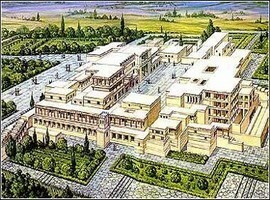 The palace was divided into four clear sections, which created a large central courtyard. 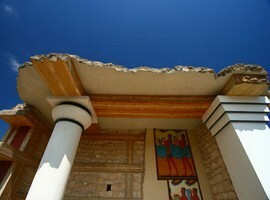 At the west there was storage space for products such as oil, wine and grain. Among these areas and the courtyard were rooms built for religious activities. 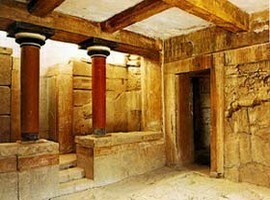 Southeast, a large staircase was leading to the two upper levels, the reception areas and residences. 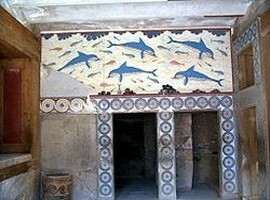 At south, there was a corridor through which visitors were entering. Workshops ceramics and stone were located north and northeast on the ground floor there were some additional storage spaces and workshops, above which there was a large reception room. 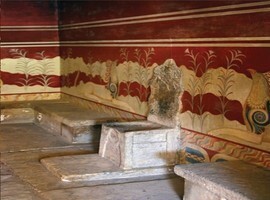 The most important rooms of the palace were adorned by murals. 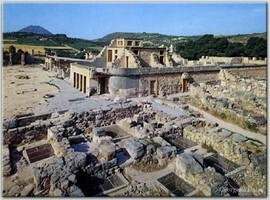 The entire palace was built of large squared stones and rough blocks the whitewasher carefully. 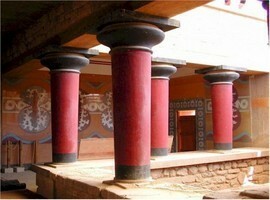 Large wooden beams framed wall sections, which were used in the construction of the roof, where they placed them on stone tablets. 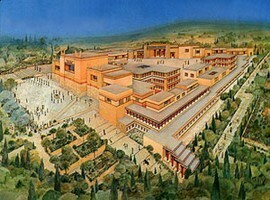 The materials of the palace were local: gypsum and limestone mined from nearby hills, the cypress wood was plentiful as well as the clay. 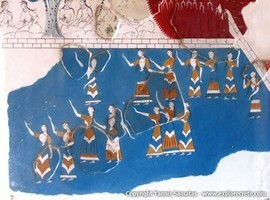 The palace was not built in one phase, but has gradually evolved over time. Its architecture his story is complex but it appears that several parts of the palace was restored after earthquakes and fires. 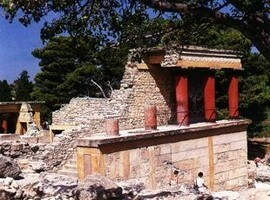 Knossos survived through many changes, but in 1375 BC, after a major disaster, most of its inhabitants deserted it. 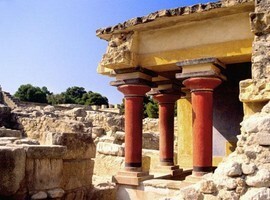 After the discovery of the palace in 1870, it was partially rebuilt by the head of excavations Arthur Evans.